The thing with going green is – there is always more to be done. However, some green rules are easier to enforce than others. For example, encouraging people to recycle paper and plastic and introducing energy-saving measures isn’t a particularly difficult endeavour. While both require training and initial investment, they rarely present a problem to modern companies. Other measures, such as completely giving up the paper, are a much bigger challenge. Many procedures in companies depend on paper and there are still a lot of old-school managers who would much rather give up computers. Still, the fact is – making your business paper-free is not only an environmentally conscious decision, it is also very smart and beneficial for your business in terms of productivity and efficiency. The whole idea of going Green is to improve the environment and lower your office’s carbon footprint. The truth is that arguably the greenest policy is to remove papers from an office completely. The reason is simply that the impact is far greater. Figures have consistently shown paper and cardboard products to occupy the largest share of landfill refuse. In 1994, for example, they represented 40% of the total solid waste generated in the US, and but it has only fallen to 28% according to 2009 figures from the EPA. And once in the landfill, papers takes a surprisingly long period of time to decompose (15 years) and creates a methane gas, one of the most destructive greenhouse gases, some 21 times more heat retaining than CO2. And, of course, tree likes you! Why? Well, while paper recycling is a good thing, there is still a requirement for some virgin wood pulp to be used in the process – so some trees do need to be cut down. If no paper is used (not even recycled paper), then zero trees need to be cut. Ecology.com reports on the research which found that 35% of the trees that are cut worldwide are later used for the production of paper and paper products. When this piece of data is considered, it becomes clear that reducing paper dependency in the business world would significantly contribute to lowering the rate of deforestation, which is alarmingly high in the world today. So, yes, those trees will definitely love you for it! Of course, there are very positive practical and financial aspects to switching to a paper-free system. Consultants are not shy to highlight the fact that storage issues are all but erased thanks to storage on hard drives, servers and on USB and discs. Filing cabinets can then be replaced by office trees. Since paper is not needed to print and store in a physical administrative folder on some shelf, there is no paper consumption and, therefore, no paper supply to replace. Figures from the US indicate that an office worker uses around 10,000 sheets of paper per year, while the cost of actually using the paper can be as high as 31-times the cost of purchasing the paper. In fact, Citigroup, the international financial services corporation, has estimated that if their employees conserved one sheet of paper per week, they would save a total of $700,000 per year. Alsco is ready to help you completely give up on paper by supplying you with alternative solutions for your washroom. Getting rid of paper towels in washrooms shouldn’t be to hard. After all, hand dryers are pretty popular these days, especially in commercial buildings. However, you are not going to lower your carbon footprint significantly if you rely on devices which use electric power. This is where Alsco comes in with cloth towels, the greenest and most effective hand drying method of them all. With cloth towels, you will ensure your washroom is as green as possible. 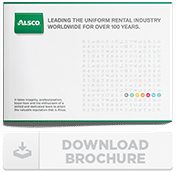 If you have any questions regarding our cloth towel service, contact Alsco’s representatives who will provide you with all the explanation you need!